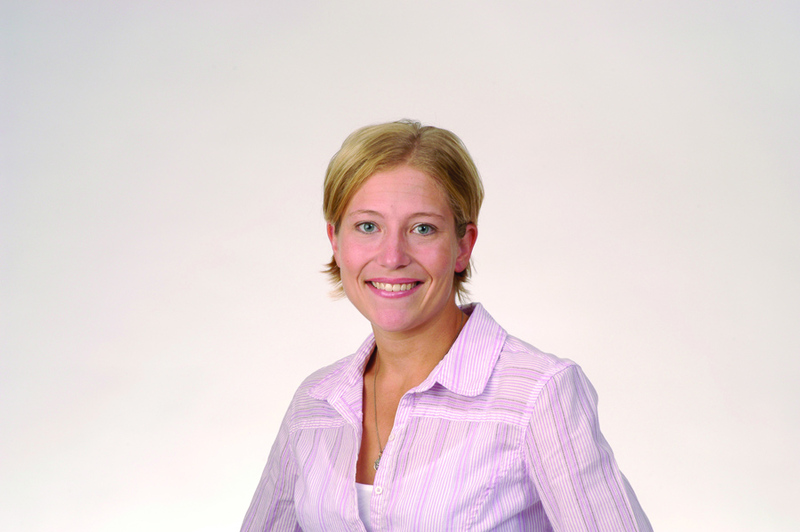 Emerald Scientific, a supplier of reagents, supplies, equipment and services to cannabis testing and extraction facilities, recently named Amanda Rigdon as the company’s chief technology officer. Rigdon previously worked at Restek Corporation, a manufacturer of chromatography supplies, as an applications chemist and a member of their gas chromatography columns product marketing team. Before working in the cannabis space, Rigdon began her career in the pharmaceutical and clinical/forensics industries. She spent seven years in Restek’s applications lab where she was responsible for the development and application of chromatography products for the pharmaceutical and clinical/forensics arenas. In recent years, she has been an outspoken advocate in the science of cannabis while with Restek. As a strong proponent for scientific progress in cannabis, she brings extensive technical expertise and marketing experience related to cannabis testing and research. Presenting at numerous cannabis science conferences and seminars, she regularly provides education on analytical methods and best practices in the lab. As a contributing author to CannabisIndustryJournal.com and member of the editorial advisory board, she writes a column addressing challenges in the lab and providing technical advice. “I’m thrilled to be a part of the Emerald Scientific team and a member of the cannabis community as a whole,” says Rigdon. “I’ve known the folks at Emerald [Scientific] for years; they’re among the best in the business, and they’ve been supporting the cannabis community since the early days of cannabis analytics.” Rigdon’s mantra in the cannabis testing space has long been to support sound science in the interest of protecting patient and consumer health. “I’m really looking forward to using my technical skills in conjunction with Emerald’s position and reach in the market to make work easier for cannabis labs through education, applications and new products,” adds Rigdon. Emerald Scientific is widely known in the cannabis testing community for The Emerald Test, an inter- laboratory comparison proficiency test, organized twice per year. It also hosts The Emerald Conference, an annual scientific meeting for scientists, policy makers, producers, and other key members of the cannabis industry. ˇThe Emerald Conference is the first scientifically focused conference for the cannabis industry, now coming up on its third annual conference in February 2017. 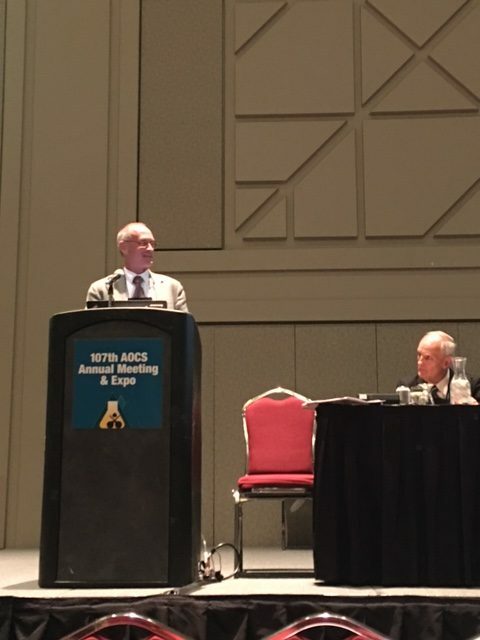 The American Oil Chemists’ Society (AOCS) held its annual conference in Salt Lake City this week, with a track focused on cannabis testing and technology. Cynthia Ludwig, director of technical services at AOCS and member of the advisory panel to The Emerald Test, hosted the two-day event dedicated to all things extraction technology and analytical testing of cannabis. Highlights in the discussion surrounding extraction technologies for the production of cannabis concentrates included the diversity of concentrate products, solvent selection for different extraction techniques and the need for cleaning validation in extraction equipment. 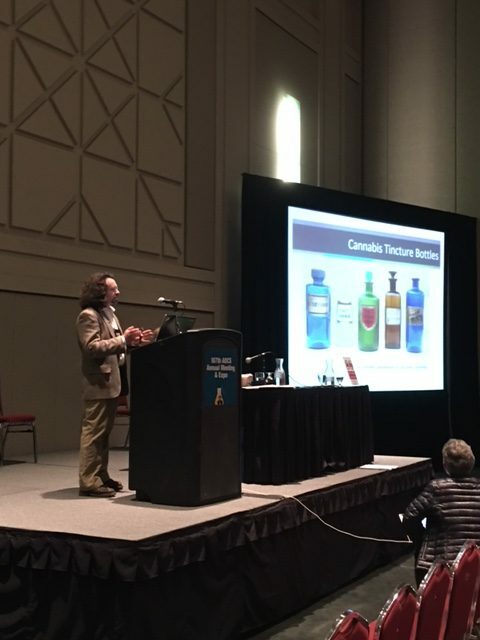 Jerry King, Ph.D., research professor at the University of Arkansas, began the event with a brief history of cannabis processing, describing the physical morphologies in different types of extraction processes. Michael McCutcheon, research scientist at Eden Labs, laid out a broad comparison of different extraction techniques and solvents in use currently. “Butane is a great solvent; it’s extremely effective at extracting active compounds from cannabis, but it poses considerable health, safety and environmental concerns largely due to its flammability,” says McCutcheon. He noted it is also very difficult to get USP-grade butane solvents so the quality can be lacking. “As a solvent, supercritical carbon dioxide can be better because it is nontoxic, nonflammable, readily available, inexpensive and much safer.” The major benefit of using supercritical carbon dioxide, according to McCutcheon, is its ability for fine-tuning, allowing the extractor to be more selective and produce a wider range of product types. “By changing the temperature or pressure, we can change the density of the solvent and thus the solubility of the many different compounds in cannabis.” He also noted that, supercritical carbon dioxide exerts tremendous pressure, as compared to hydrocarbon solvents, so the extraction equipment needs to be rated to a higher working pressure and is generally more expensive. John A. Mackay, Ph.D., senior director of strategic technologies at Waters Corporation, believes that cannabis processors using extraction equipment need to implement cleaning SOPs to prevent contamination. “There is currently nothing in the cannabis industry like the FDA CMC draft for the botanical industry,” says Mackay. “If you are giving a child a high-CBD extract and it was produced in equipment that was previously used for another strain that contains other compounds, such as CBG, CBD or even traces of THC extract, there is a high probability that it will still contain these compounds as well as possibly other contaminants unless it was properly cleaned.” Mackay’s discussion highlighted the importance of safety and health for workers throughout the workflow as well as the end consumer. 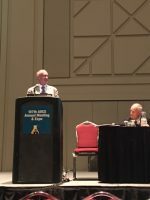 Jeffrey Raber, Ph.D., chief executive officer of The Werc Shop, examined different testing methodologies for different applications, including potency analyses with liquid chromatography. His presentation was markedly unique in proposing a solution to the currently inconsistent classification system for cannabis strains. “We really do not know what strains cause what physiological responses,” says Raber. “We need a better classification system based on chemical fingerprints, not on baseless names.” Raber suggests using a chemotaxonomic system to identify physiological responses in strains, noting that terpenes could be the key to these responses. Cynthia Ludwig welcomes attendees to the event. 46 cannabis laboratories participated in The Emerald Test’s latest round of proficiency testing for potency and residual solvents. Cynthia Ludwig sits on the advisory panel to give direction and industry insights, addressing specific needs for cannabis laboratories. Kirsten Blake, director of sales at Emerald Scientific, believes that proficiency testing is the first step in bringing consistency to cannabis analytics. “The goal is to create some level of industry standards for testing,” says Blake. Participants in the program will be given data sets, judged by a consensus mean, so labs can see their score compared to the rest of the cannabis testing industry. 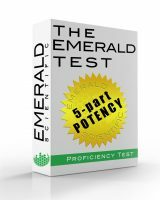 Proficiency tests like The Emerald Test give labs the ability to view how consistent their results are compared to the industry’s results overall. According to Ludwig, the results were pleasantly surprising. “The results were better than expected across the board; the vast majority of labs were within the acceptable range,” says Ludwig. The test is anonymous so individual labs can participate freely. The AOCS cannabis working groups and expert panels are collaborating with Emerald Scientific to provide data analytics reports compliant with ISO 13528. “In the absence of a federal program, we are trying to provide consistency in cannabis testing to protect consumer safety,” says Ludwig. 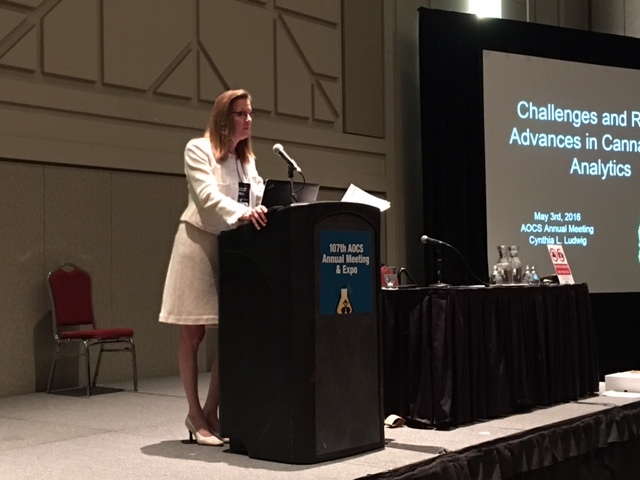 At the AOCS annual meeting, many echoed those concerns of consumer safety, proposing solutions to the current inconsistencies in testing standards. This column is devoted to helping cannabis analytical labs generate valid data right now with a relatively small amount of additional work. The topic for this article is instrument calibration – truly the foundation of all quality data. Calibration is the basis for all measurement, and it is absolutely necessary for quantitative cannabis analyses including potency, residual solvents, terpenes, and pesticides. Just like a simple alarm clock, all analytical instruments – no matter how high-tech – will not function properly unless they are calibrated. When we set our alarm clock to 6AM, that alarm clock will sound reproducibly every 24 hours when it reads 6AM, but unless we set the correct current time on the clock based on some known reference, we can’t be sure when exactly the alarm will sound. Analytical instruments are the same. Unless we calibrate the instrument’s signal (the response) from the detector to a known amount of reference material, the instrument will not generate an accurate or valid result. Without calibration, our result may be reproducible – just like in our alarm clock example – but the result will have no meaning unless the result is calibrated against a known reference. Every instrument that makes a quantitative measurement must be calibrated in order for that measurement to be valid. Luckily, the principle for calibration of chromatographic instruments is the same regardless of detector or technique (GC or LC). Every calibration curve for chromatographic analyses is expressed in terms of response and concentration. For every detector the relationship between analyte (e.g. a compound we’re analyzing) concentration and response is expressible mathematically – often a linear relationship. Now that we’ve introduced the key concept behind calibration, let’s talk about the two most common and applicable calibration options. Assumption #1 is never true, and assumption #2 is rarely true. Generally, single point calibration curves are used to conduct pass/fail tests where there is a maximum limit for analytes (i.e. residual solvents or pesticide screening). Usually, quantitative values are not reported based on single point calibrations. Instead, reports are generated in relation to our calibrator, which is prepared at a known concentration relating to a regulatory limit, or the instrument’s LOD. Using this calibration method, we can accurately report that the sample contains less than or greater than the regulatory limit of an analyte, but we cannot report exactly how much of the analyte is present. So how can we extend the accuracy range of a calibration curve in order to report quantitative values? The answer to this question brings us to the other common type of calibration curve. A multi-point calibration curve is the most common type used for quantitative analyses (e.g. analyses where we report a number). This type of curve contains several calibrators (at least 3) prepared over a range of concentrations. This gives us a calibration curve (sometimes a line) defined by several known references, which more accurately expresses the response/concentration relationship of our detector for that analyte. 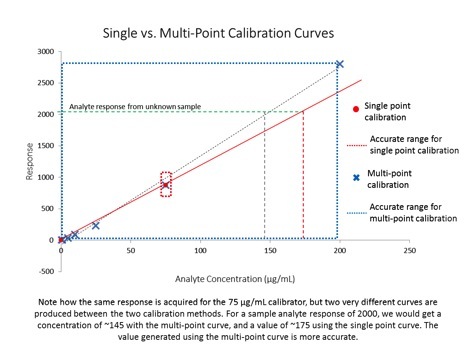 When preparing a multi-point calibration curve, we must be sure to bracket the expected concentration range of our analytes of interest, because once our sample response values move outside the calibration range, the results calculated from the curve are not generally considered quantitative. This article provides an overview of the two most commonly used types of calibration curves, and discusses how they can be appropriately used to report data. There are two other important topics that were not covered in this article concerning calibration curves: 1) how can we tell whether or not our calibration curve is ‘good’ and 2) calibrations aren’t permanent – instruments must be periodically re-calibrated. In my next article, I’ll cover these two topics to round out our general discussion of calibration – the basis for all measurement. If you have any questions about this article or would like further details on the topic presented here, please feel free to contact me at amanda.rigdon@restek.com. I have been working with the chemical analysis side of the cannabis industry for about six years, and I have seen tremendous scientific growth on the part of cannabis labs over that time. Based on conversations with labs and the presentations and forums held at cannabis analytical conferences, I have seen the cannabis analytical industry move from asking, “how do we do this analysis?” to asking “how do we do this analysis right?” This change of focus represents a milestone in the cannabis industry; it means the industry is growing up. Growing up is not always easy, and that is being reflected now in a new focus on understanding and addressing key issues such as pesticides in cannabis products, and asking important questions about how regulation of cannabis labs will occur. While sometimes painful, growth is always good. To support this evolution, we are now focusing on the contribution that laboratories make to the safety of the cannabis consumer through the generation of quality data. Much of this focus has been on ensuring scientifically sound data through regulation. But Restek is neither a regulatory nor an accrediting body. Restek is dedicated to helping analytical chemists in all industries and regulatory environments produce scientifically sound data through education, technical support and expert advice regarding instrumentation and supplies. I have the privilege of supporting the cannabis analytical testing industry with this goal in mind, which is why I decided to write a regular column detailing simple ways analytical laboratories can improve the quality of their chromatographic data right now, in ways that are easy to implement and are cost effective. Anyone with an instrument can perform chromatographic analysis and generate data. Even though results are generated, these results may not be valid. At the cannabis industry’s current state, no burden of proof is placed on the analytical laboratory regarding the validity of its results, and there are few gatekeepers between those results and the consumer who is making decisions based on them. Even though some chromatographic instruments are super fancy and expensive, the fact is that every chromatographic instrument – regardless of whether it costs ten thousand or a million dollars – is designed to spit out a number. It is up to the chemist to ensure that number is valid. In the first couple of paragraphs of this article, I used terms to describe ‘good’ data like ‘scientifically-sound’ or ‘quality’, but at the end of the day, the definition of ‘good’ data is valid data. If you take the literal meaning, valid data is justifiable, logically correct data. Many of the laboratories I have had the pleasure of working with over the years are genuinely dedicated to the production of valid results, but they also need to minimize costs in order to remain competitive. The good news is that laboratories can generate valid scientific results without breaking the bank. In each of my future articles, I will focus on one aspect of valid data generation, such as calibration and internal standards, explore it in practical detail and go over how that aspect can be applied to common cannabis analyses. The techniques I will be writing about are applied in many other industries, both regulated and non-regulated, so regardless of where the regulations in your state end up, you can already have a head start on the analytical portion of compliance. That means you have more time to focus on the inevitable paperwork portion of regulatory compliance – lucky you! Stay tuned for my next column on instrument calibration, which is the foundation for producing quality data. I think it will be the start of a really good series and I am looking forward to writing it.